Traders are sticking to a losing bet that a placid stretch for stocks is coming to an end. The CBOE Volatility Index, or VIX, an options-based measure of expected stock-market swings, last week hit its lowest level since 2007. The Dow Jones Industrial Average has gone 32 months without a 10% decline, the fifth-longest run on record. The S&P 500 hasn’t closed up or down 1% in 46 days, the longest stretch since 1995. Yet the number of outstanding options contracts that profit from a rise in VIX futures ended Wednesday at its highest level since January’s all-time high, at 8.1 million, according to Trade Alert. Many traders are betting the market has become too calm and that volatility is overdue for a spike. “You just kind of figure it’s going to come back eventually,” said John King, a former computer programmer turned full-time trader who has actively traded options on VIX exchange-traded funds since 2011. Mr. King, 47 years old, lives in Pasadena, Calif. But so far, those betting on greater swings have been losing money. Any investor who bought the biggest and most widely traded VIX fund, the $1 billion iPath S&P 500 VIX Short-Term Futures exchange-traded note, or VXX, at the start of this year would have lost more than 32%. Investors are split over the roots of the market’s tranquility and what it might mean. Some traders say a host of forces, led by slowly gathering U.S. growth and expansive central-bank policy, will keep a lid on asset-price swings and wrong-footed bets on volatility. Others say record stock indexes and high bond prices spell trouble and wild trading ahead. Belmont Capital manages portfolios for clients that profit from sudden spikes in volatility, and those that make money when volatility retreats. The $523 million VelocityShares Daily Inverse VIX Short-Term ETN, which profits when volatility falls, has climbed 30% this year. 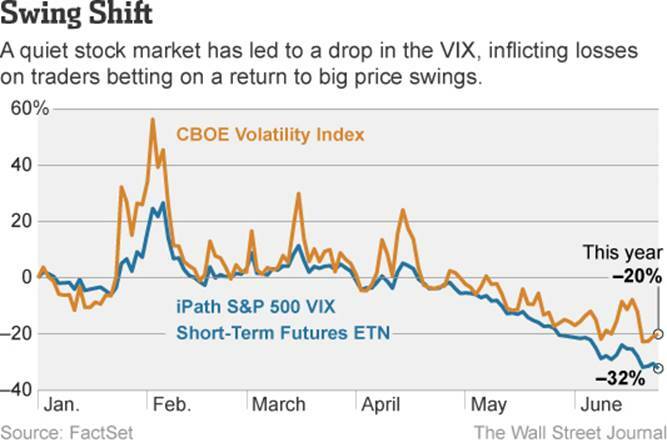 Some investors have been betting on volatility in both directions at various times. Mr. King, who earlier this month tweaked his positions while visiting Disneyland, is set up to profit from additional declines in the VIX. “I learned not to have all the eggs in one basket,” he said. Jim Strugger, derivatives strategist at MKM Partners, said this month that the low VIX was “indicative of short-term instability,” and recommended using options for protection. Trades based on volatility are nothing new. Betting on regular VIX spikes was a popular and often-lucrative strategy for hedge funds and short-term traders after the financial crisis. What is different this year is that trading has been so quiet that many investors believe volatility has nowhere to go but up. In the past 10 years, the VIX has averaged 20.08, including a 2008 financial-crisis spike above 80 and a 2011 euro-crisis jump to 48. This year the VIX has averaged 13.9. At the end of May, some $2.7 billion was wrapped up in 17 ETFs tied to the VIX, up 11% from the end of 2013, according to Morningstar. Daily trading volume in the VXX last month was 23.8 million shares, more than double the 10.3 million that traded, on average, in May 2013. Mr. Frederick warns that the math behind most VIX-tracking investment products “are not in your favor.” No money is directly invested in the VIX itself, which is based on options prices in the S&P 500 index. Instead, funds are invested in so-called VIX futures. Typically, the funds are forced to buy longer-term futures that erode in value, perpetually buying high and selling low. Since its inception in 2009, the VXX is down more than 99%. A spokesman for Barclays, which oversees iPath products, declined to comment. The perceived shortcomings of many volatility-investment products and the low-volume trading environment have encouraged traders to bet that the VIX can dive still lower. Christian Wagner, president of EagleView Capital, which oversees about $600 million, has been betting on a falling VIX all year. But Mr. Wagner has pulled back recently because he isn’t convinced low volatility is here to stay. Others warn that spikes in volatility often occur due to unforeseen events, such as the 2011 Fukushima nuclear accident in Japan, which sent the VIX up nearly 30%. “You’re only knocked out by the punch you don’t see,” said J.J. Kinahan, chief strategist for TD Ameritrade.